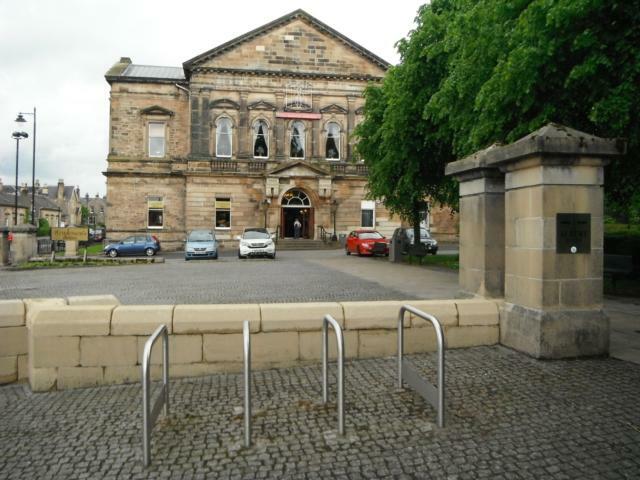 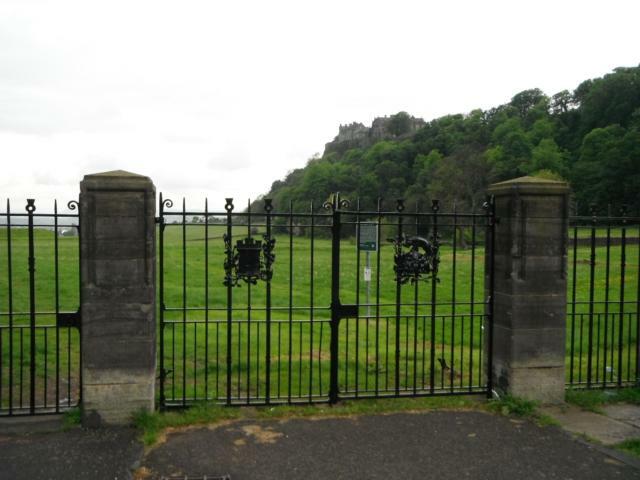 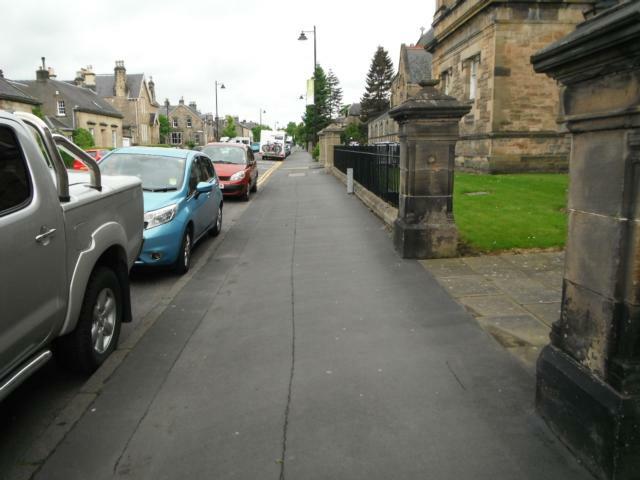 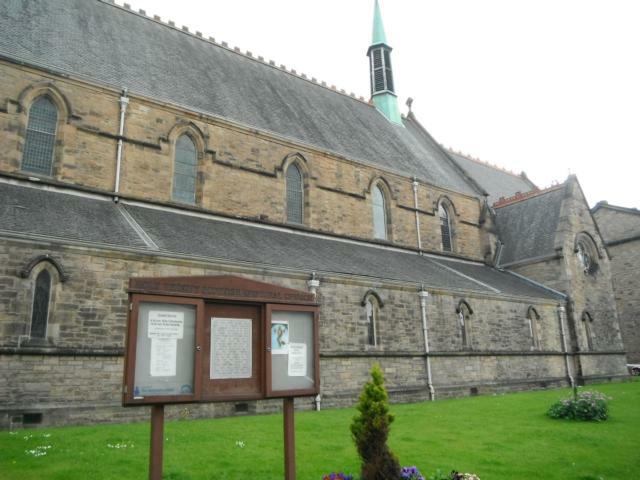 This route takes you from Stirling railway station to to the King's Knot at the base of the castle via the city centre, the Albert Halls and the Smith Art Gallery and Museum. The route is reasonably flat with only a few short, easy gradients. 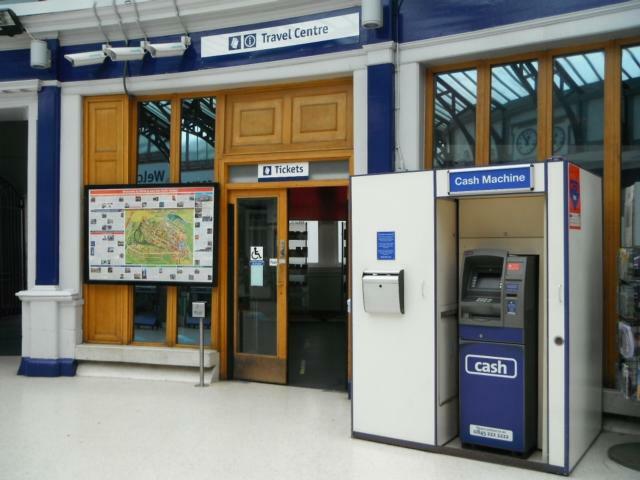 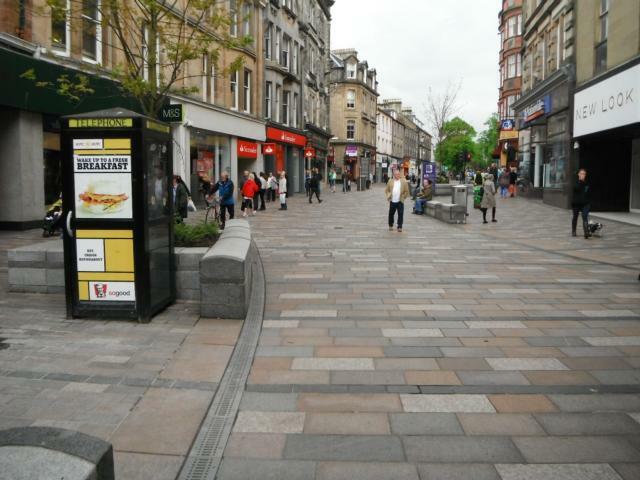 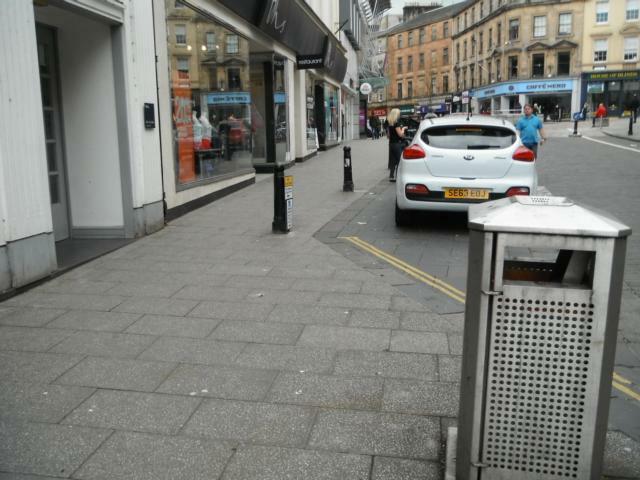 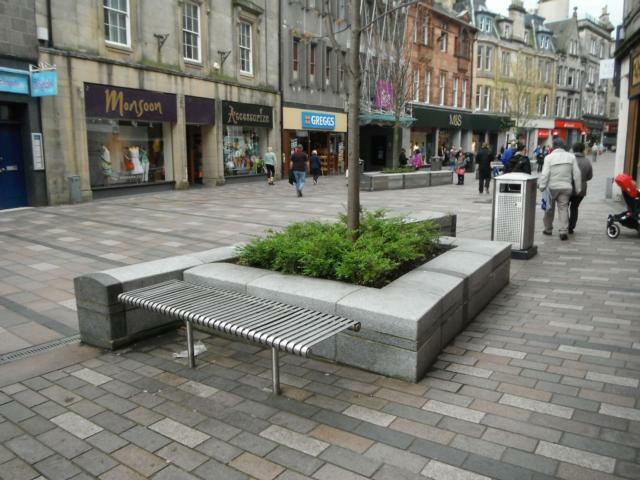 There are lots of facilities that can be found in the pedestrianised city centre such as cash points, food outlets, public telephones and seating. 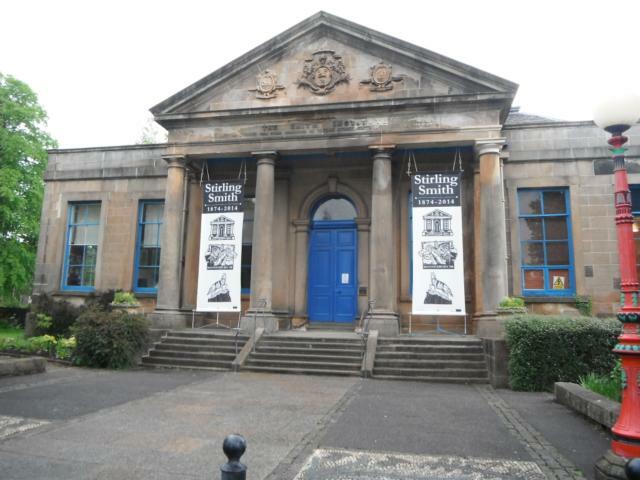 The section between the pedestrianised centre and the King's Knot does not have any seating but a visit to the Smith Art Gallery is worthwhile and is a good opportunity for a break. There is a cafe and toilets in the museum. 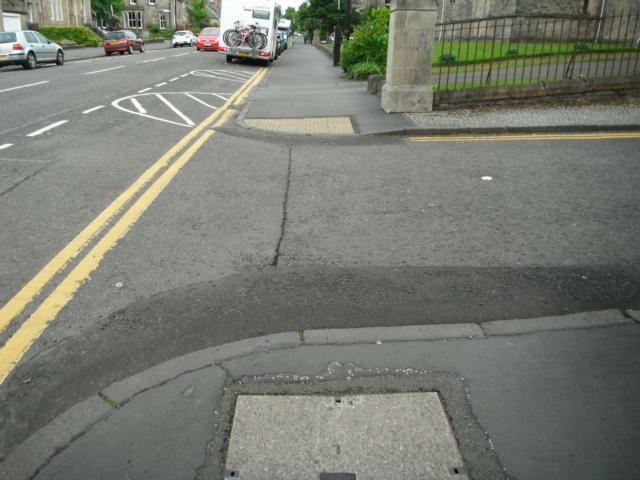 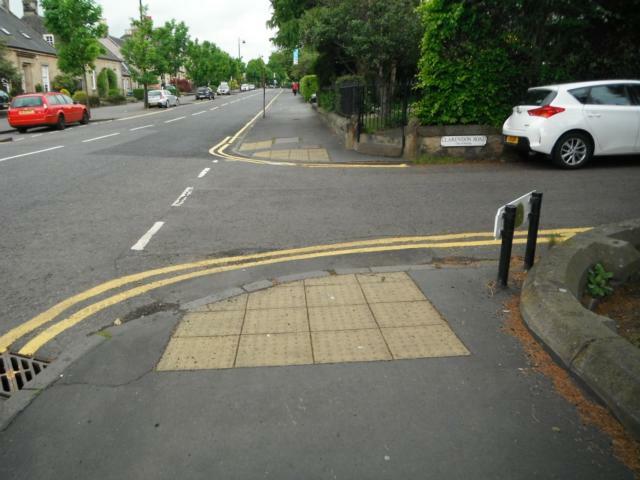 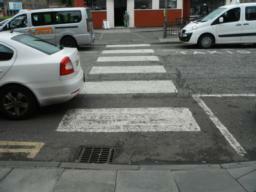 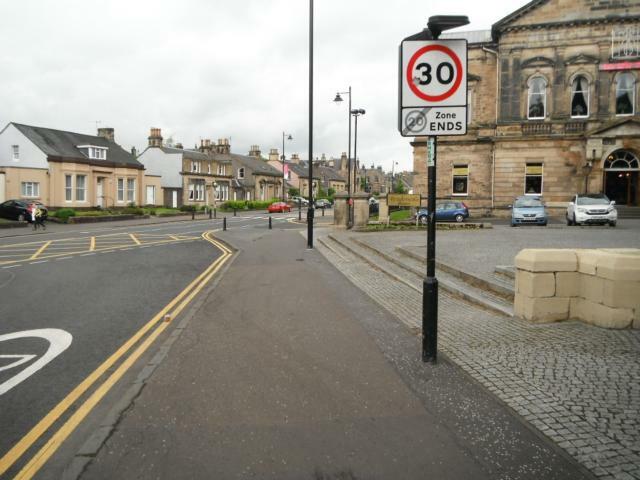 All road crossings have dropped kerbs and usually tactile paving. 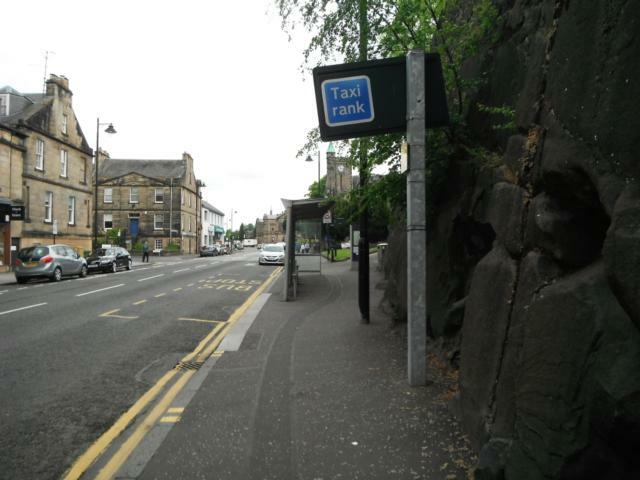 Public Transport: Public transport is available. 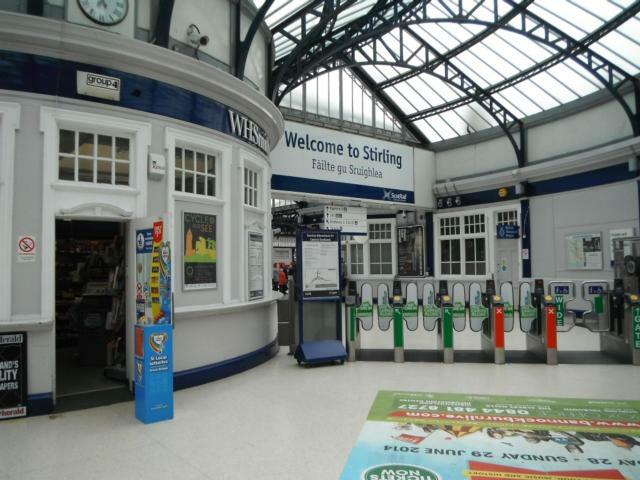 You can ask for bus service information at the Stirling bus station or go to Traveline Scotland www.travelinescotland.com or phone 0871 200 22 33. Toilets: Toilets are available in the railway station, including disabled toilets, and the Thistle Centre (shopping centre with an entrance by the bus station and pedestrianised city centre). 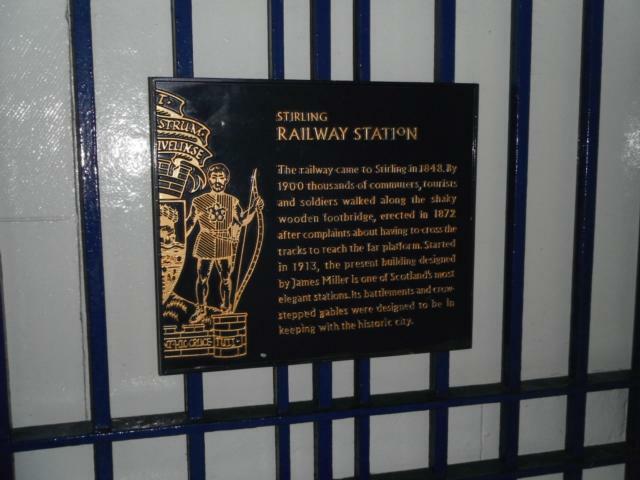 Stirling railway station ticket barriers. 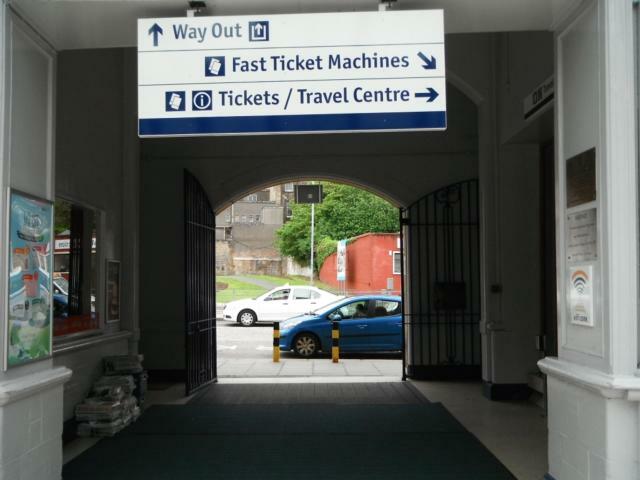 You can't get to the plaforms unless you go through them with a valid ticket. Arrival and departure board plus disabled toilets. 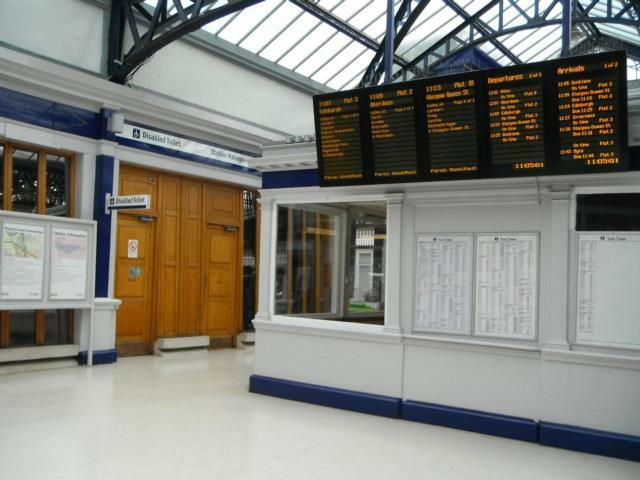 General toilets exist on the opposite platform over the bridge. Cash point, ticket machine (just out of picture) and travel centre. 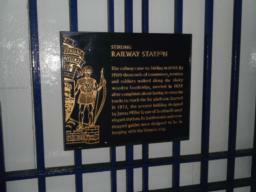 Historical information plaque about the railway station. 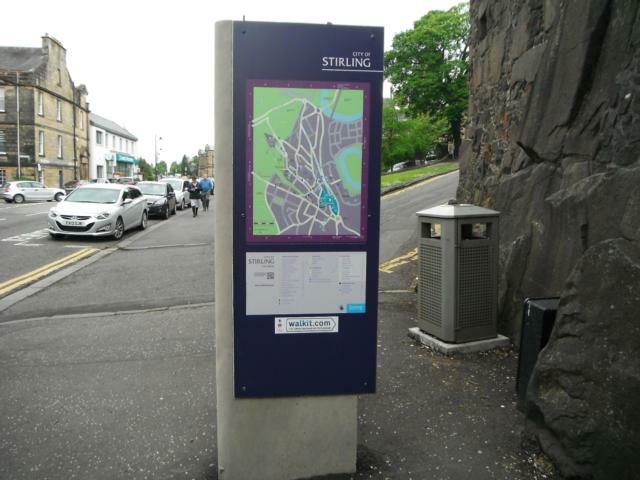 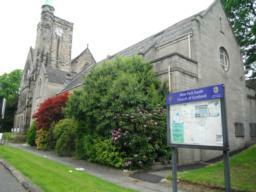 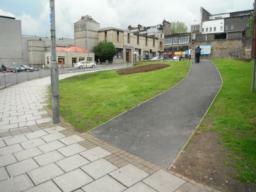 Stirling Bike Hub offers information on all things to do with cycling in and around Stirling. 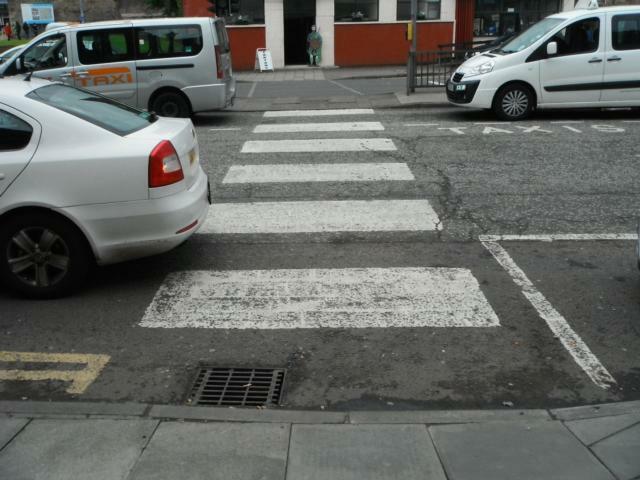 Zebra crossing by drop off point outside the station. Dropped kerbs on both sides of crossing. 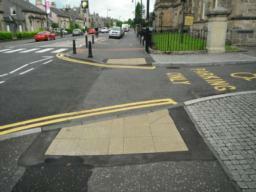 Controlled pedestrian crossing with dropped kerbs. 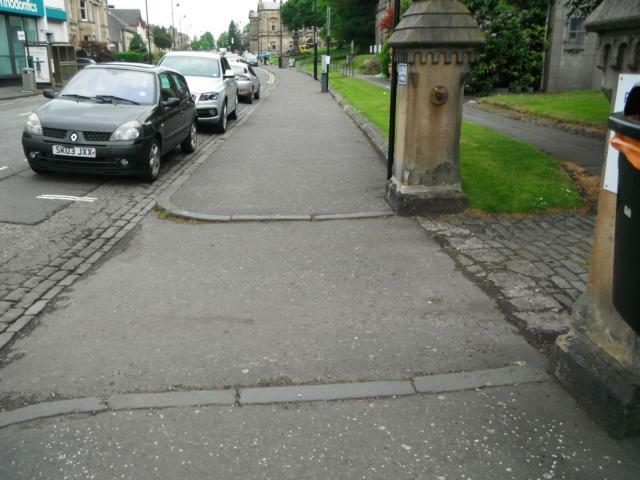 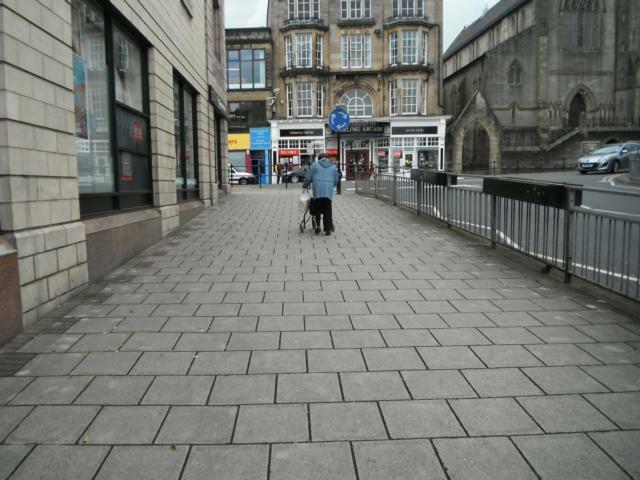 Both the pavement and the path are wide and can be used. 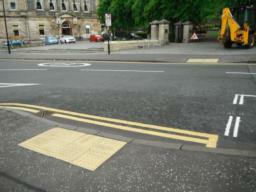 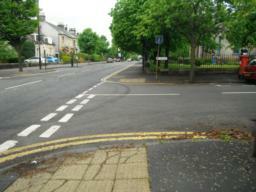 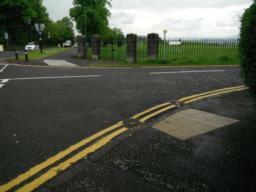 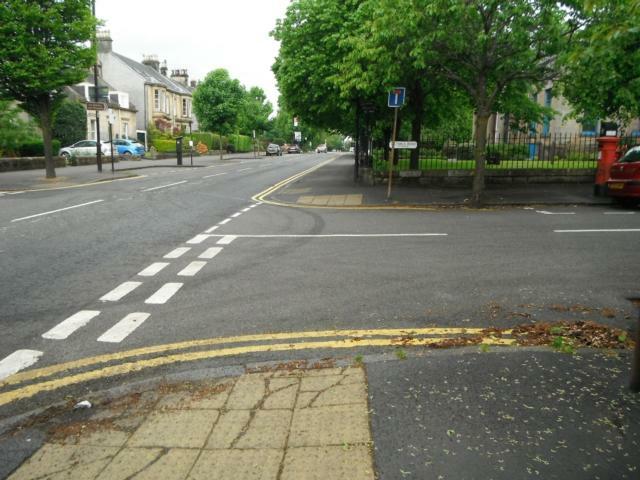 Controlled crossing point with dropped kerbs. 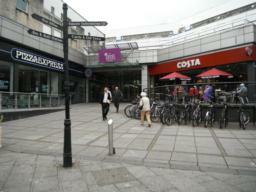 Start of the city centre. 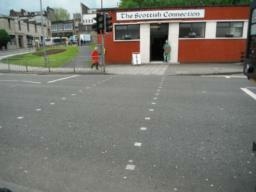 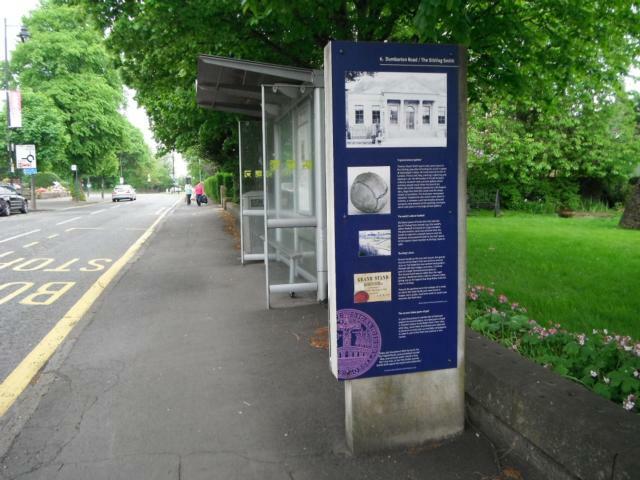 There is an information board, sign post, shelter under shop canopy, ATM and litter bins. 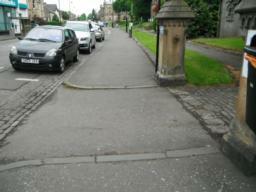 The pavement remains wide. 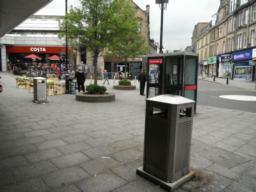 City centre amenities such as public telephones, litter bins, shelter under shop canopies. 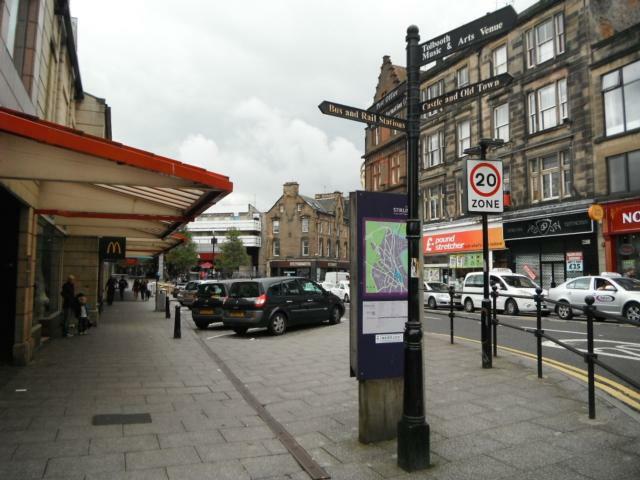 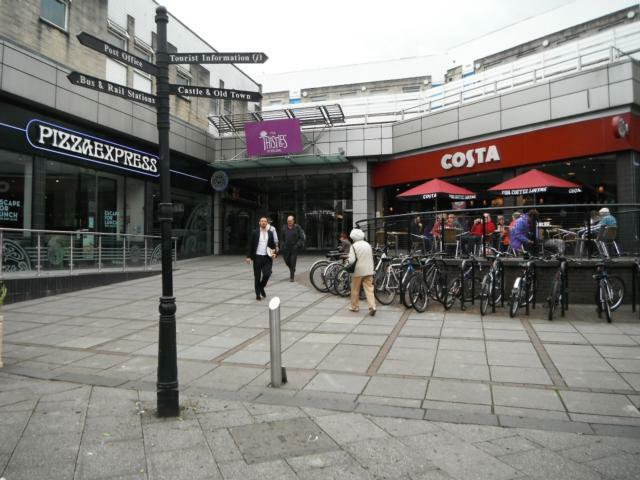 City centre amenities incluing sign posts, cafes and one of entrances to the Thistle Shopping Centre where there are shops, cafes, toilets and seats. 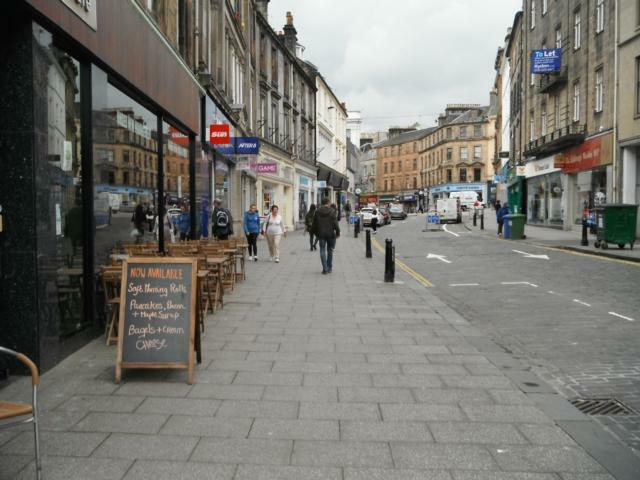 Continue along the wide pavement past more cafes, shops and an ATM. 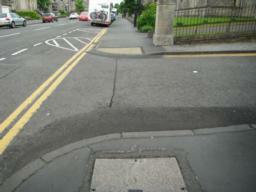 Pavement narrows but it is still wide enough. 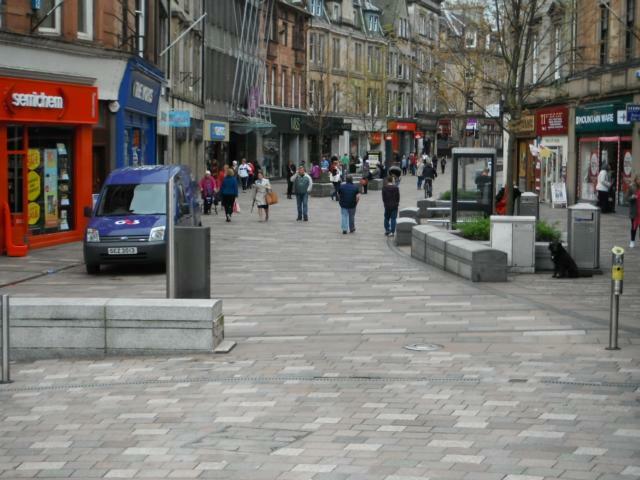 The pedestrianised city centre. 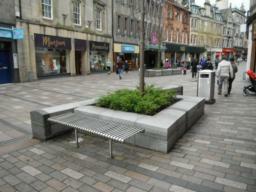 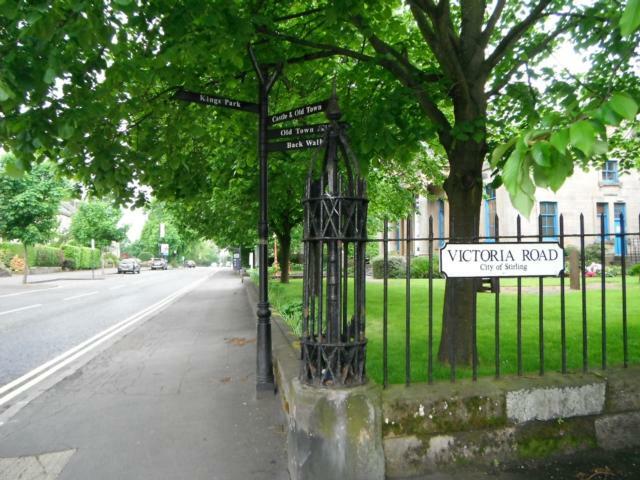 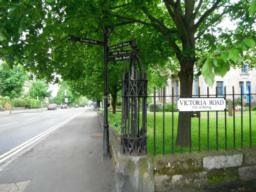 This area offers cafes, food outlets, public telephones, seating, information boards and ATMs. 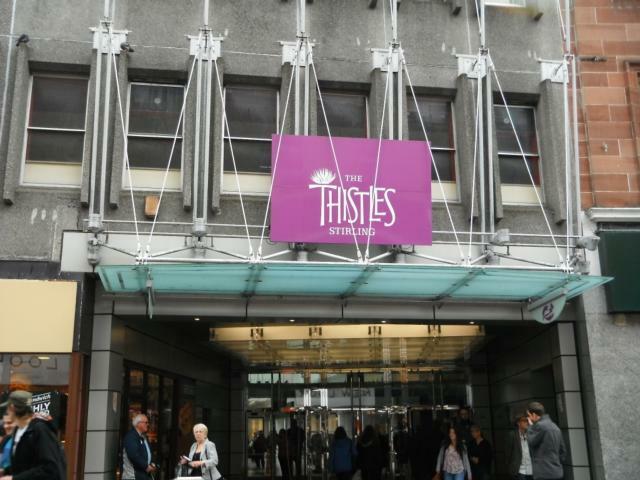 Entrance to the Thistle Shopping Centre. 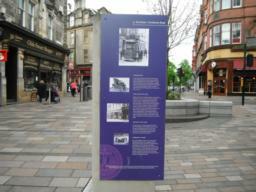 Information board located near the end of the pedestrianised area. 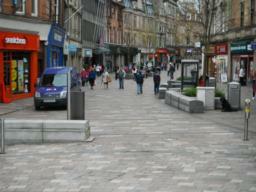 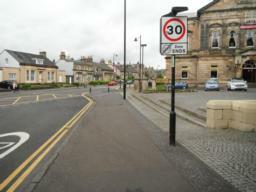 Leave the pedestrianised centre and continue along the pavement. 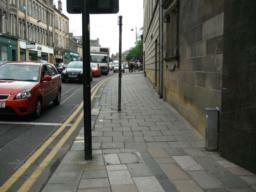 Sign posts are on the pavement but still wide enough for mobility scooters to pass. 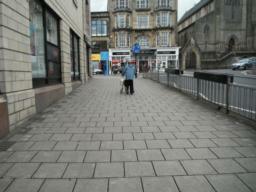 Wide pavement continues. Opportunity to go up the hill to the Corn Exhange entrance to the old town. 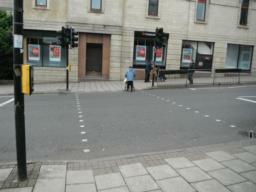 Crossing point across pavement. 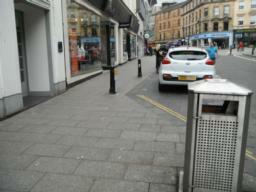 Dropped kerbs present. 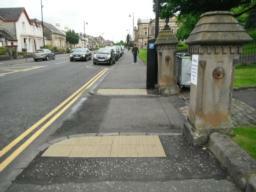 Dropped kerbs and tactile paving at crossing point. 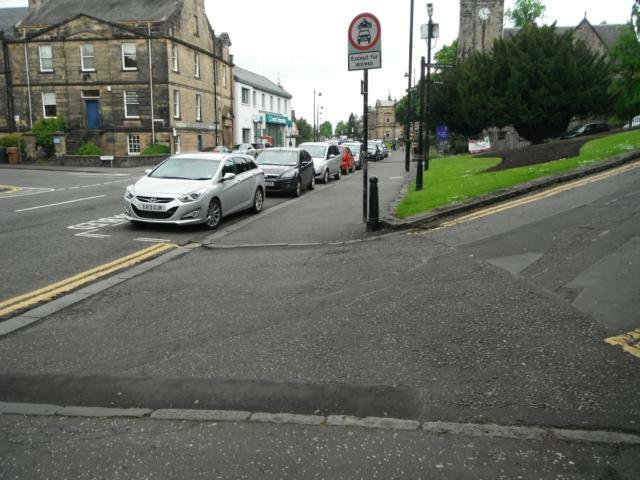 There is a short incline on the corner up to the tactile paving crossing point. 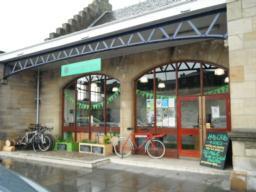 The Alert Halls has a restaurant, toilets, cycle parking and on site car parking. 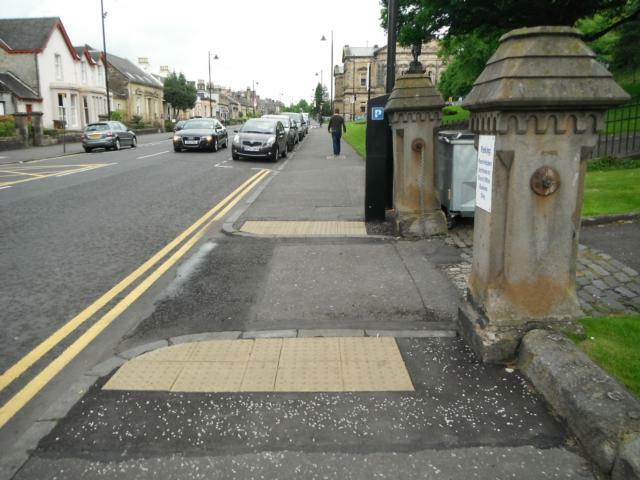 Dropped kerbs and tactile paving at crossing points. 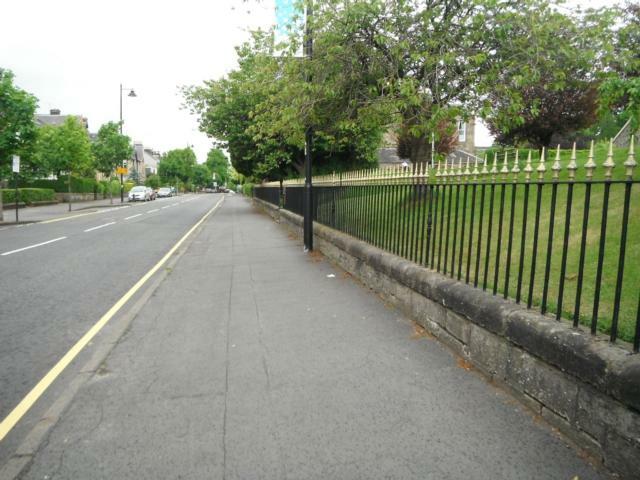 Passing by the bowling club. 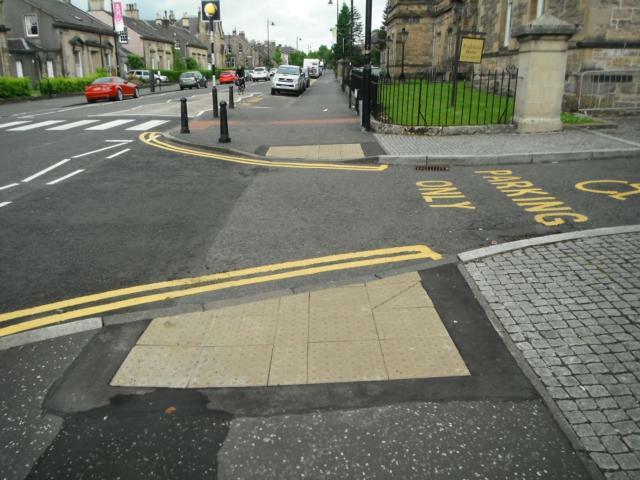 Dropped kerbs and tactile paving at crossing. Fingerpost outside the Smith Museum showing directions to different places in the area. The Smith Museum entrance. 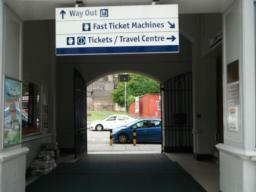 There are toilets and a cafe inside with a pleasant garden to the rear. Bus stop as well as an information board with local history. 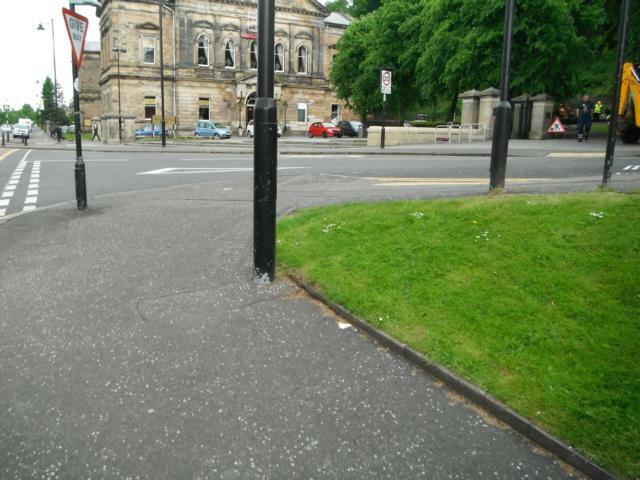 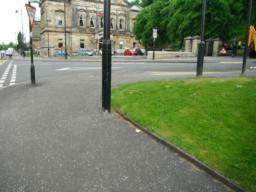 Dropped kerbs and tactile paving in place at crossing to the King's Knot. 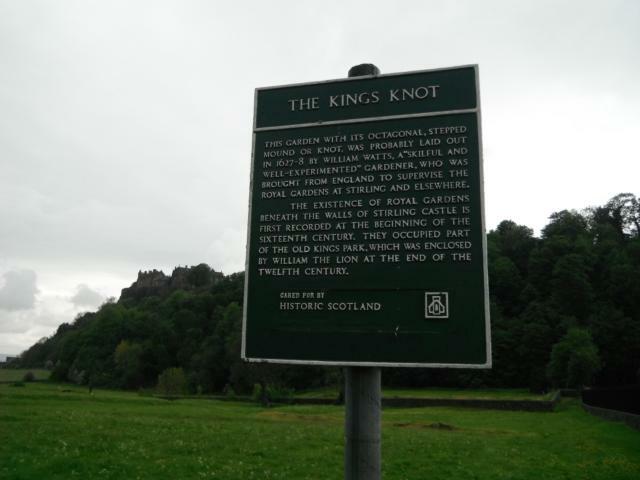 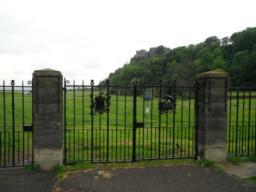 Entrance to the King's Knot with Stirling Castle in the background. Information board about the King's Knot.